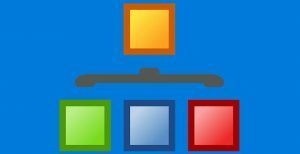 Adding subcategories, or as it is done in a WordPress blog, adding a category to a parent category is an easy way to keep your blog organized and easy to navigate. There are a few words of warning about WordPress categories before we get started with this quick WordPress Guide. First, beware if you are using categories in a custom Permalinks structure. I use /%postname%/ as a Permalink structure if you use this or any combination that has category in your Permalink structure consider that any change of, or deletion of a WordPress category will also change the URL of any posts made within that category. You are not going to lose your post but any links from other sites pointing to that URL will be broken because the change of the URL made by changing or deleting the category the post was in. So some careful consideration should be taken when creating categories so you don’t need to make future changes. The temptation to just start adding categories based on what you think you may be blogging about should be avoided. So before you start making tons categories and subcategories you should also consider the length of the category name and hierarchy. If you plan on using Parent categories and placing categories under them consider what direction your blog will eventually lead to. An example would be using Web Traffic as a Parent category and then add more focused categories under it like Pay Per Click, Traffic Exchanges and Link Exchanges. Did I lose you already or are you still with me on all this? If using categories and postname in your Permalinks structure WordPress, by default, will use the name of the category and the WHOLE title of your post as part of the post’s URL. The trick here is to keep the URL as short and to the point as possible while maintaining the benefit of the keywords created by the category and title of the post. This is compounded by adding subcategories, or as it is actually done in the manage categories dashboard, adding a category to a parent category. As you can see this gets kind of long and ugly but there are ways to shorten this with a little careful consideration when creating new categories and use of the Category Slug and Post Slug box. So to avoid long ugly post URL’s, try to keep category names short and keyword rich. I wouldn’t go more than two categories deep and use the Category Slug when creating categories and Post Slug box when writing a post. To shorten the URL of the post name when writing a post look over to the right and use the Post Slug box to shorten the trailing end of the URL. Example – if your post title is “How To Work At Home In Your Dirty Underwear While Drinking Beer” put this in the Post Slug box: work-at-home-underwear. Try to make it as short as possible while maintaining the top keywords in the post slug. 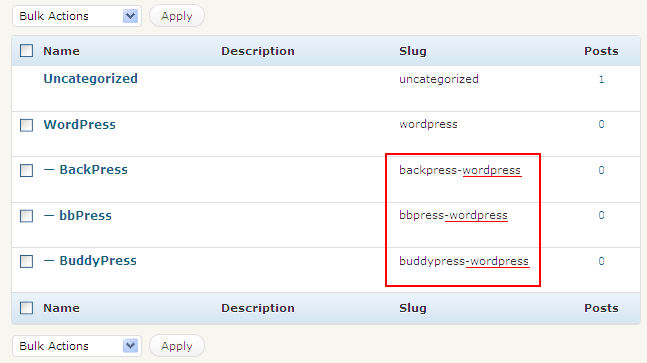 Adding categories and subcategories or as WordPress calls it, adding a category to a Parent category. Go to Post, Categories, Click (Add New) the Category Name is what will show on the sidebar, if the category is more than two words long you can also create a Category Slug to shorten the URL of it just like I explained for a post slug above. To add the new category under a parent category just click the drop-down box and choose the parent category. You can also add a description in the optional description box. I suggest adding WordPress categories the way described above instead of doing it from within the Write Post screen, this way you can utilize the Category Slug option to shorten the categories URL. Of course, none of the warnings about the URL’s applies if you are using the default Permalinks structure. To check your Permalink structure go to Options, Permalinks. Do you have any questions about this blog post that you need help with? Share them below in the comment section.